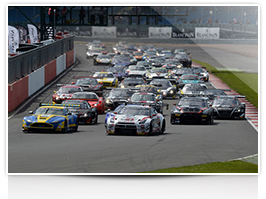 This year’s Blancpain GT Series is made up of the Blancpain Endurance Series as well as the Blancpain Sprint Series, and the action gets underway this weekend at Pirelli’s home circuit of Monza, only half an hour away from the company’s Milan headquarters. Monza hosts the opening round of the Endurance series, with a full grid of 44 cars representing 12 different brands. Pirelli will supply tyres to both Series exclusively, with the vast majority of the premium manufacturers represented also using Pirelli P Zero as original equipment on their road cars. The cars eligible will be GT3 race versions of road-going sports cars, with a wide range of engine and drivetrain configurations – but they all have Pirelli in common. This year the grids have been boosted by the arrival of some former F1 stars, including Alex Zanardi, Nelson Piquet Jr, and Jerome d’Ambrosio, and new manufacturers such as Bentley. While both Series have their own separate rankings, there will also be an overall Blancpain GT Series title for the highest-scoring driver and team to contest both series. The winner of the overall series will receive a €100,000 prize fund from the organiser, as well as a tyre prize from Pirelli for the top three in the championship: emphasising the Italian firm’s commitment to GT racing using cars and tyres that resemble those of production models. For Monza, Pirelli will supply a competition product to meet the massive demands of one of the fastest tracks on the calendar, characterised by long straights and also some high kerbs that put plenty of energy through the tyres. This underlines both the performance and the durability of Pirelli’s products, as seen in Formula One this year. This unique combination is also the reason why there have been 380 bespoke homologations of P Zero tyre since the brand was launched, underlining Pirelli’s aim to become the established world leader in the Ultra High Performance sector. For racing, the Blancpain Endurance Series cars will have two types of tyre available: one slick tyre and one wet tyre. However, the tyres have been extensively reworked since last year, with the aim of increasing resistance and durability still further: the key characteristics needed in endurance racing. The other main advantage of Pirelli’s product for endurance racing is its versatility. The tyres will need to cope with a wide range of conditions, from the heat of Paul Ricard to the cold of the Nurburgring, and the abrasive asphalt of Zandvoort to the smoother surface of Zolder. Not only that but the tyres need to cope with the intensity of sprint races together with the length of endurance races – including the Spa 24 Hours. On top of that, they has to be as user-friendly for a gentleman driver as they are for a seasoned professional. Monza, the home of the Italian Grand Prix, is spent mostly at full throttle. Because of the long straights, the cars run with low downforce, meaning that grip is at a premium in the corners and drivers frequently experience understeer. This weekend will also host a round of the Pirelli-supplied Lamborghini Blancpain Super Trofeo: the world’s fastest one-make series. Pirelli’s racing manager Mario Isola commented: “We’re delighted that the Blancpain GT Series is starting with an endurance round so close to our home, as we enter into our second year of supplying the series. Monza is well-known as a tough test for any tyre, because of the very high speeds reached and the also the heavy braking areas. This year’s tyres are an evolution of the previous year’s tyres, which helped to provide an extremely entertaining season, with enhancements focussed on even greater durability.” Qualifying for the Blancpain Endurance Series takes place in the afternoon of Saturday 12 April, with the race on Sunday lasting for three hours. or +44 7765 896 930.